Does your Aunt have 3 birds? Did your babysitter just get a ferret and can’t stop talking about her? Does your co-worker have turtles all over his desk? Now that you narrowed it down to which type of pet lover you are shopping for, the fun part begins. But you want the gift to be thoughtful and unique. Does your grandmother really need another poodle pin? Does your son’s teacher need another “I love cats” mug? Does your co-worker want another turtle figurine cluttering up his desk? You could spend hours running around town and/or looking online for unique Christmas gifts for the pet lovers on your list. I have made it easier for you. Whatever your price range, I have put together some ideas specifically related to various pets–along with a link on where you can buy the items. 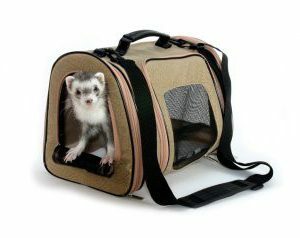 Trusted Housesitters is a great option for pet owners–especially for multiple pet households or people with pets that cannot be boarded easily–like ferrets! Pets get to stay in their familiar surroundings with all the normal smells of home and family and the family gets to take a vacation without worrying about their pets and their home. Learn more about it here: Trusted Housesitters. Another gift idea appropriate for a variety of pet lovers is an air cleaner designed especially for homes with all types of pets. Small, easy to use and very effective. You can learn about it here: Pet Air Cleaner. How about a cute cat face purse and coin purse set for your niece? Or cat themed bedding set? 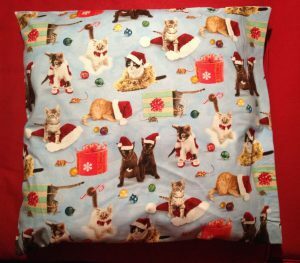 Or a handmade Christmas kitty throw pillow? Or a cat lawn statue? Find them and more by clicking here. 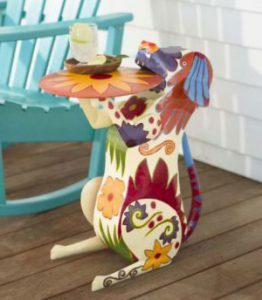 What about a unique and colorful dog indoor/outdoor accent table? Or a desk fan in the shape of a dog? Or a cute puppy face purse and wallet set? Or a dog themed comforter and pillow sham set? Or a dog breed lamp? Or a Christmas lawn decoration featuring dogs? Find them and more here. Does the ferret lover on your list enjoy taking his ferret along on outings? How about a ferret backpack or travel carrier? Find them, along with other ideas here. Does your bird lover drink wine? Consider a bird wine bottle holder. 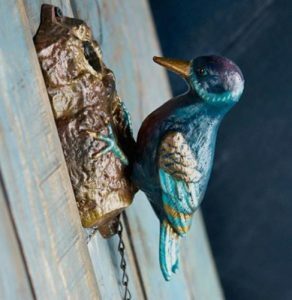 Or a woodpecker door knocker? Or an owl wall hanging or lamp? Or a bird themed bedding set? Looking for bunnies? How about a silver serving dish and spreader in the shape of a bunny? 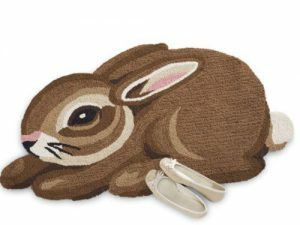 Or a rug in the shape of a rabbit? See these and more here. Mice? Hamsters? Consider these great gift ideas. Would the fish lover on your list enjoy having a decorative Beta fish display on his desk? Take a look at this great gift here. Does your turtle lover have a yard, patio or deck? Consider turtle yard decorations. 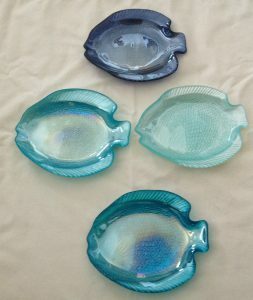 Or what about wall decor or a unique floor mat for the fish and reptile lovers on your list? Get some great ideas here. I hope I have given you some unique gift ideas for the pet lovers in your life. But remember, Christmas isn’t the only gift giving time. Stop by this site and check out unique pet lover gifts for birthdays, Valentine’s Day, and any other time you want to give a pet lover a special gift. Ideas and items are added and updated frequently. You have some very good ideas here. With Christmas coming fast, this is really helpful. I love the paw print furniture protector and I think it would be a good gift for most dog owners. I will get my sister an owl wall hanging or one of the owl lamps – she loves owls. That is one present off my list! I’m so happy you found some ideas for pet lovers on your list. Maybe you could put the paw print furniture protector on your wish list! You have the cutest site, with tons of information. I’ve always thought ferrets are just the cutest animals. The site is broken up nicely so you can read whatever articles you’re looking for. Great job ! I’m happy you like my site. Thanks for stopping by. I hope you found some useful info about ferrets and maybe a gift idea or two for pet lovers. These are great gift ideas. I like the cat bed spread and a basket for your bike for your dog is a cool idea. It is hard for me to buy gifts for my dad and just recently I thought that maybe ill buy him a gift but for his dog. Glad I found this post! I’m happy you liked the gift ideas for pet lovers. When you buy a pet related gift for someone (like your dad), it is really a gift for the person. The pet may get some benefit from it, like with the bike basket, but mainly the person you are giving the gift to is the one who will enjoy it most(usually)! Great article! Thanks a lot. I do not have any pets, but I am going to buy some presents for my mom´s dog. A fantastic idea! And another question: How did you create this page? Which program do you use? I like your website very much. I’m glad you liked the site and got some gift ideas for your mom’s dog. I LOVE this post! It is so informative and hits really close to home. My aunt has a bird that is her world, and it honestly didn’t even occur to me to get something for him… your post reminded me that I should! Thanks for that. My hubby and I recently got a kitten and we have been contemplating getting him his own stocking. Your article has remind me that pets are family. They deserve Christmas too! Thanks, Darcy! Pets should be part of the family! My pets have always had Christmas stockings! Ferrets love tunneling in them and dragging out their gifts! Maybe you could get your kitten a ferret for Christmas! See my post: Do Ferrets Get Along with Cats?